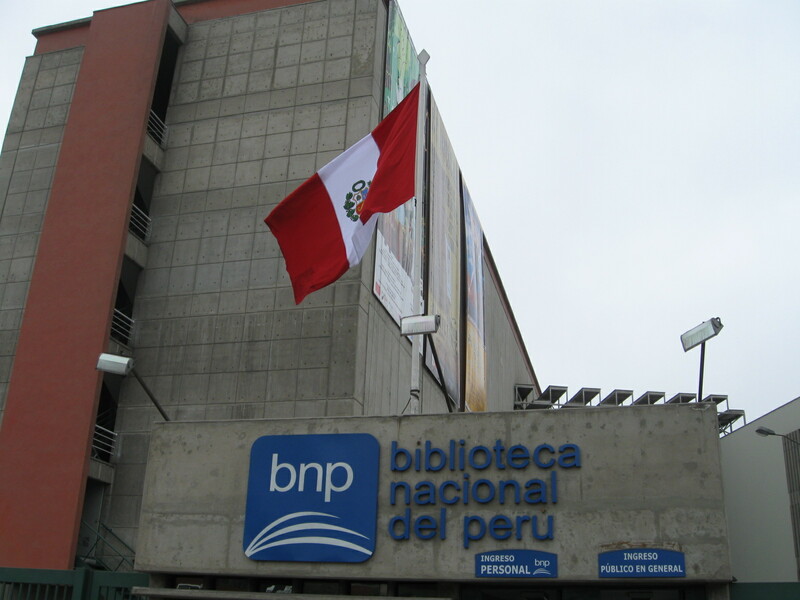 Though I usually write about public libraries, I think the Biblioteca Nacional del Perú (BNP) can qualify as the public is allowed to use it (they can’t check out items-but this seems to be common practice for libraries in Peru, though the Miraflores library and some Lima libraries may be exceptions). For reasons I’ll get into later, this is a high security location, so entering without a library card (residents pay 8 soles/year (about $2), researchers pay 40 soles and children 2.5 soles) through the guard post was a bit difficult until I explained that I was a bibliotecario (librarian) and they sent me to their administrative offices. Luckily some staff there spoke English so I was able to explain the reason for my visit. We were introduced to Jorge Mateo Acuña, who gave an extremely helpful and informative tour of the building. 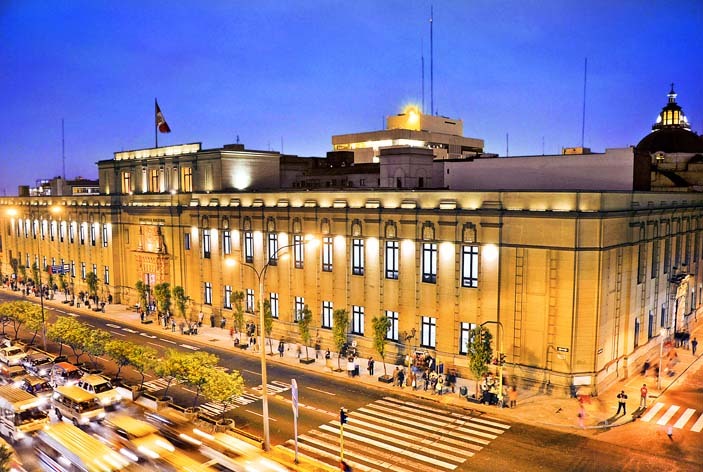 The library was opened in 1821 (one month after the Peruvian independence), but moved from its central Lima location to a huge new building on Avenida de la Poesia (Poetry Ave.) in 2006. At 20,000 square meters, it’s quite impressive with a soaring lobby, glass elevators and four floors. 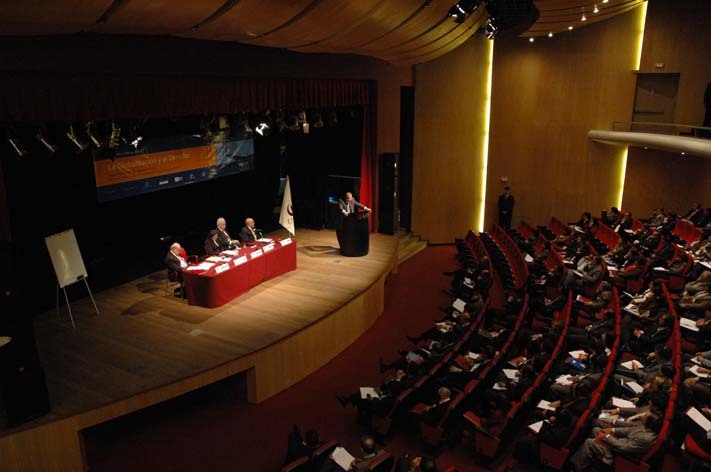 …lecture halls and a 700 seat outdoor amphitheatre. The 533 seat auditorium has public theatrical performances such as El Mago (The Wiz) and a film forum (I saw ads for Slumdog Millionaire). 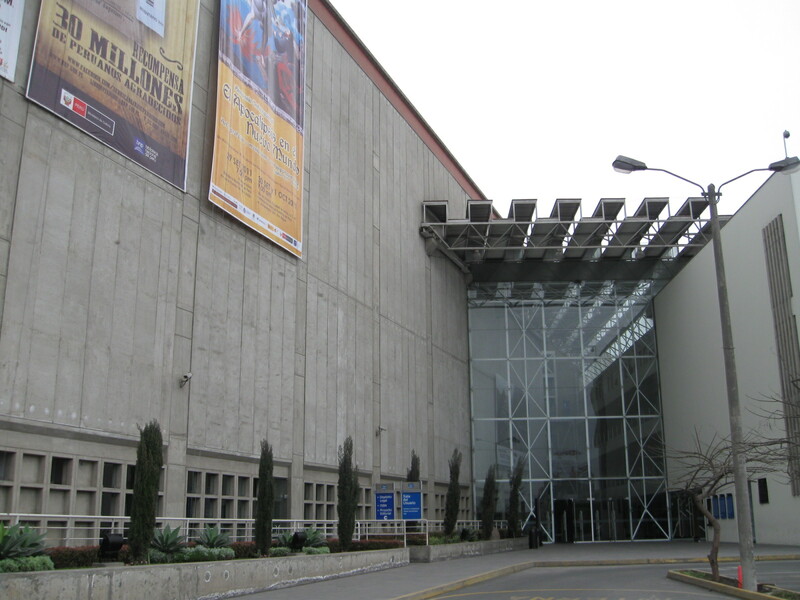 They also work with other institutions to put on events and exhibits such as El Apocalipsis en el Nuevo Mundo (Revelation in the New World: art, prophecy and messianism in Latin America (XVI-XVIII century). 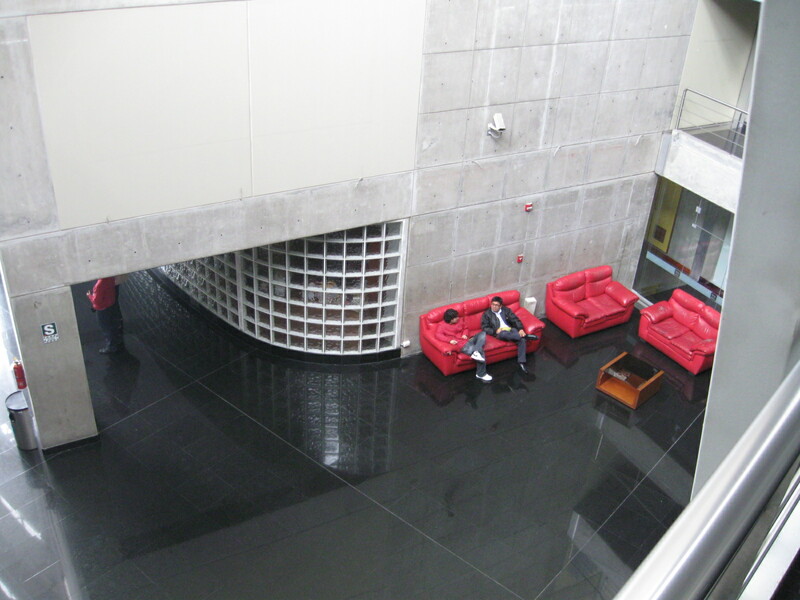 Though there are no public computers, they have wi-fi, so people can access their online catalog. 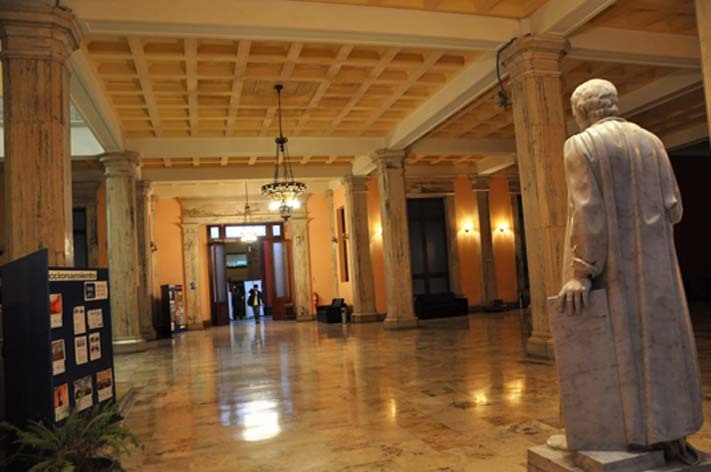 I asked Senor Mateo about the other public libraries in Lima and he told me that there are branches around Lima, especially in the poorer districts. 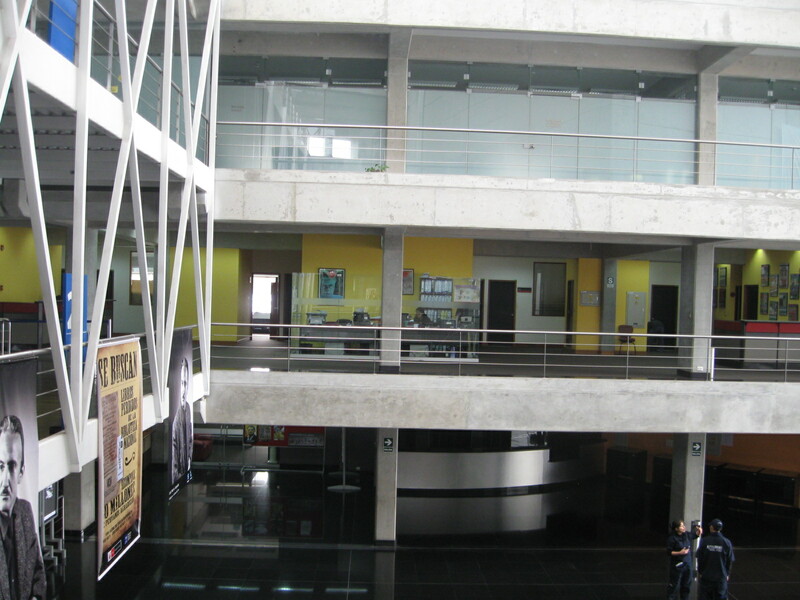 The Public Library of Lima, which occupies the historical building where the BNP was previously located, has a children’s room as well as art and science titles and they do storytimes every weekend. What a beautiful old building-I’m so sorry I didn’t get to see it! Senor Mateo also said that every district has a local library. 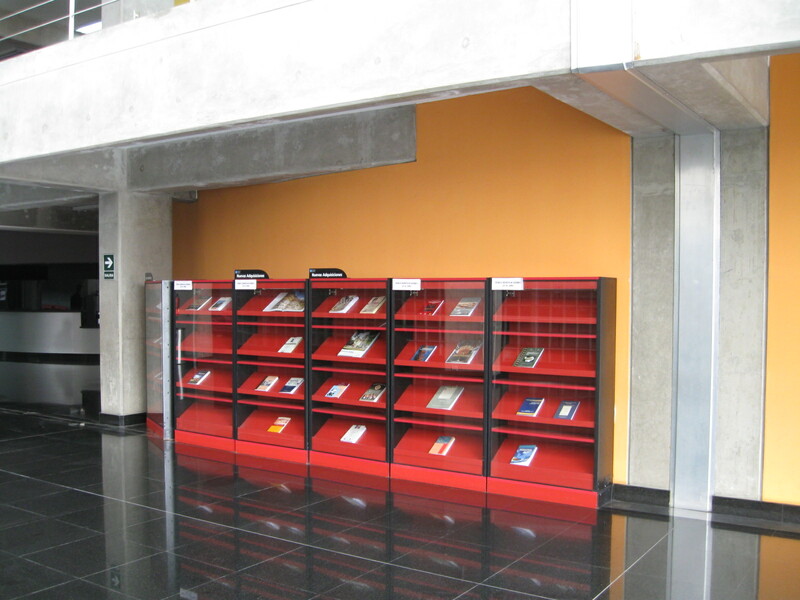 Librarians retrieve the books for you, and the collection is housed in a variety of locations. 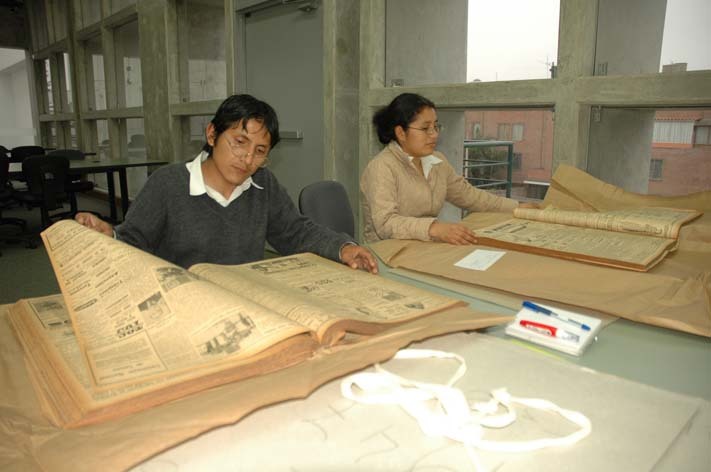 Specific areas are set aside for ancient books and maps, special materials, microfilm etc. The room below houses more than 5000 historical photographs from the early 1900’s. They have a lot of audiovisual material including DVDs and videos and are digitizing old films and audio recordings so eventually the public will be able to access them. Because Peru has had a number of high profile antiquities robberies facilitated by people taking pictures of the locations of security cameras and valuable items, I couldn’t take photos of most of the areas we visited on our tour. The library itself was a victim, and when they realized that a number of items appeared to be missing, they closed and did an inventory. 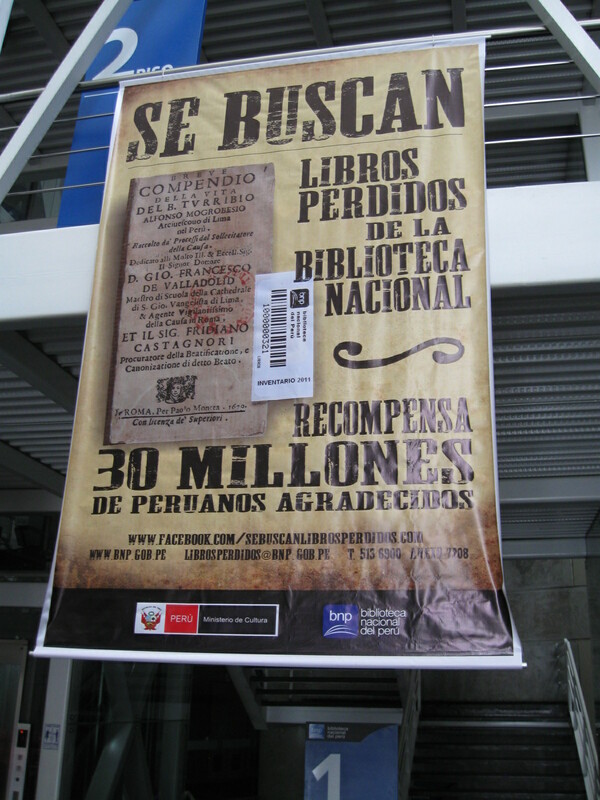 Over 1500 very valuable books had been stolen or lost over thirty years, so they started a campaign to get the titles back (“your reward will be the gratitude of your countrymen”). 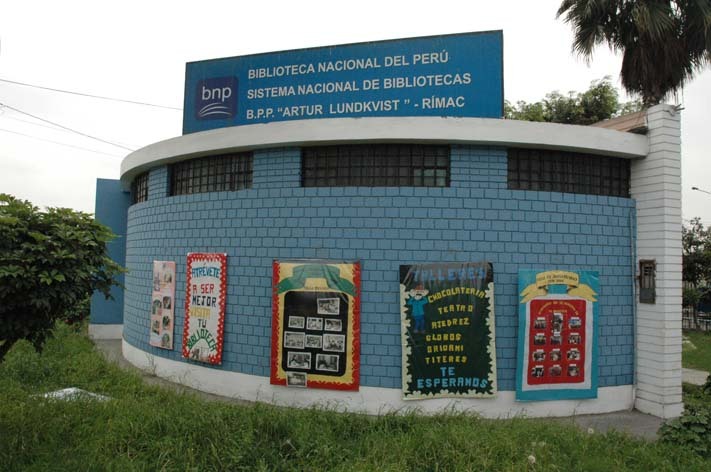 The publicity appears to be working – recently, seven of the missing books were left at a church and the Archbishop of Lima himself returned them to the BNP. And they seem to have very good security now, in fact they have video footage of a security guard stealing a very important book worth about $3000. 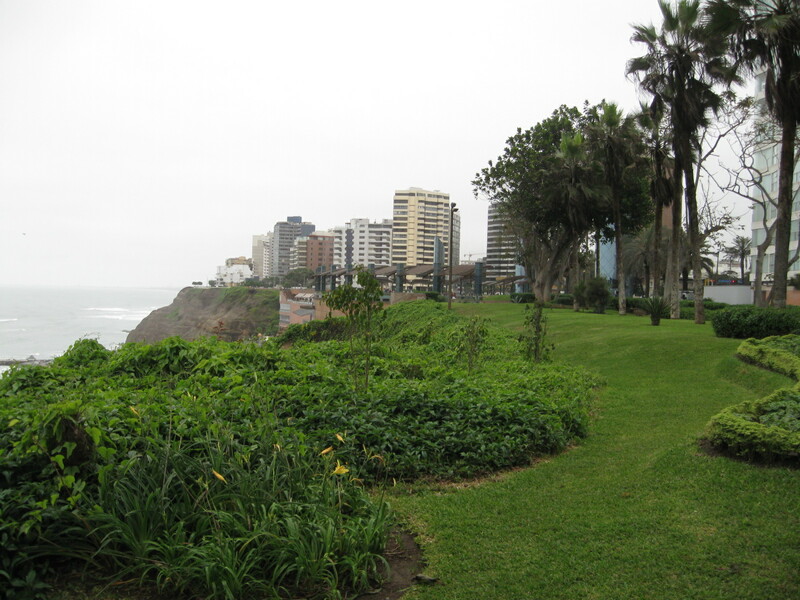 Despite my hotel’s best efforts, we weren’t able to confirm that any other Lima public libraries were open on the Wednesday I was available, but I did get a chance to see the outside of the lovely Biblioteca Municipal de Barranco in another Lima neighborhood. It’s being renovated, so I couldn’t go inside, but what a beautiful building. 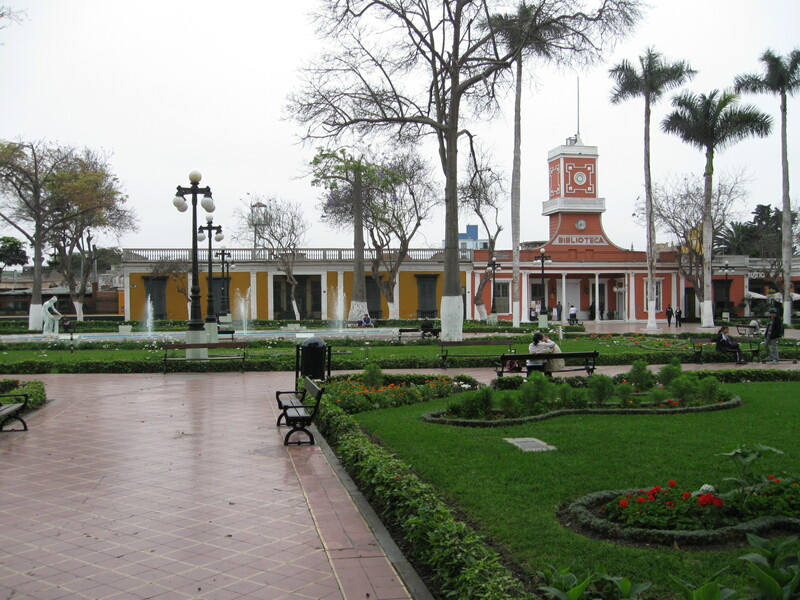 It’s perfectly located amidst fountains and foliage in the charming town plaza. There’s an adjacent restaurant, and someone at the tourist bureau told me that a lot of students visit the library to read books and magazines. She also mentioned that they have storytimes for children. How beautiful! We have yet to visit the national library. I miss our neighborhood library back “home”. Venturing out to the library is so different here, it’s more of a half-day sojourn than the simple weekly outing that we used to take by foot. The municipalidad where we live is somewhat of a bedroom community, although it has undergone hyper-development in the last 10 years or so, doesn’t even have a library. To visit a library, we have to navigate heavy traffic and be paranoid about where we leave the car, plus I have small children so I have to be extra cautious. So, we visit San Isidro or Miraflores libraries perhaps once or twice a month at best. The kids enjoy it, but I have to say making it happen is stressful. Unfortunately what I’ve found and have been told is that services for “the masses”, publico, nacional, popular or whatever you want to call it, is considered undesirable, while private is “good”. I was just mentioning to my husband how I’d like to sign up our child in some theater classes and the national school of fine arts does have a program over the summer – and he told me, that’s not for us, remember, just because its “nacional” does not mean it’s good. I know it’s complicated, it’s just how it is, and we are but guests here, but it makes me sad. And I’ve mentioned taking the children to the library to other (Peruvian) moms from the kids’ school who tell me they didn’t even know a library was there, obviously it doesn’t even occur to them to bring their children. It’s just a little jarring to me that visiting a library, which should be a neutralizing and equalizing place, suddenly becomes a social statement. But I suppose that is the whole point. I will say that there are some nice resources for children, albeit we have to drive some distance to get to them. Of course I would love to see expanded collections in these rooms, but I’m grateful that there is anything at all. I have such great memories of my public library as a child, I really wish I could create that for my kids here.